Keeping with our "shopping in the natural foods aisle at Stop & Shop" theme, Mom decided to pick up a vacuum-sealed loaf of Mestemacher Pumpernickel Fitness Bread ($2.50). I know, it's a lot to say. It's also a lot to hold - 17.6 ounces of "bread." Yeah, right. We wondered what this stuff really was. I couldn't wait to try a slice (seven long slices per package). The next morning, I decided to have a piece of bread. As I opened the package, I read that the slices were delicious when toasted. What a good idea! I grabbed my toaster and slid a slice of bread out of the package. The piece was so long that I had to cut it in half to fit it into the two toaster slots. Before pressing down the appliance's lever, I snagged a piece of raw bread off of the end and took a bite. THE VERDICT: Hmm ... let me think about this for a second. I was immediately turned off by the grainy, fibery taste. However, as I chewed it for a bit, the taste grew on me. I was dying to see what it tasted like toasted, and lo and behold it was actually a little better (with butter on it, of course). When Mom tried it, she told me that she did not hate the flavor, but it was not something that she would go for again. She described it as dense but moist and extremely filling. One piece is enough for ANYONE. Trust me. I tried to have two pieces the next day and almost died. The taste is hard to describe. 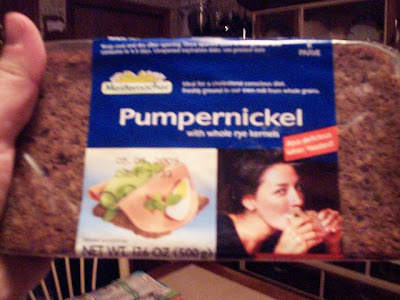 Although the package said "pumpernickel," neither Mom nor I could pick up that flavor. We wouldn't necessarily say that it tasted like rye or wheat, either. Although we weren't crazy about this bread, we will say that it is low in calories (120 calories per slice/10 from fat), high in fiber (24%), and does not contain any sugar. It is wheat and cholesterol free, Kosher, and made with natural ingredients. I must warn you - once you open the package, you have to consume the bread within the next four to five days and keep in it the refrigerator. I hate playing "Beat the Clock" with expiration dates, so needless to say I've been eating a lot of this bread - and I probably don't need to ever eat anymore.